Our hearts go out to friends and family of the Thailand bombing victims. Since a pipe-bomb exploded at a popular shrine in Bangkok, causing many deaths and injuries, the tragedy has been top-of-mind for us here at TuGo. If you’re planning a trip to Thailand or are already there and have been affected by the bombing, here’s what you need to know. Contact local emergency services immediately to get medical attention. If you’ve got a TuGo™ Travel Insurance plan and need support, call our worldwide collect emergency number at 604-278-4108. We’ll coordinate medical care and help you get in touch with the Canadian Embassy or Consulate if needed. Your Travel Medical Insurance or Trip Interruption Insurance may cover your injuries and return home. 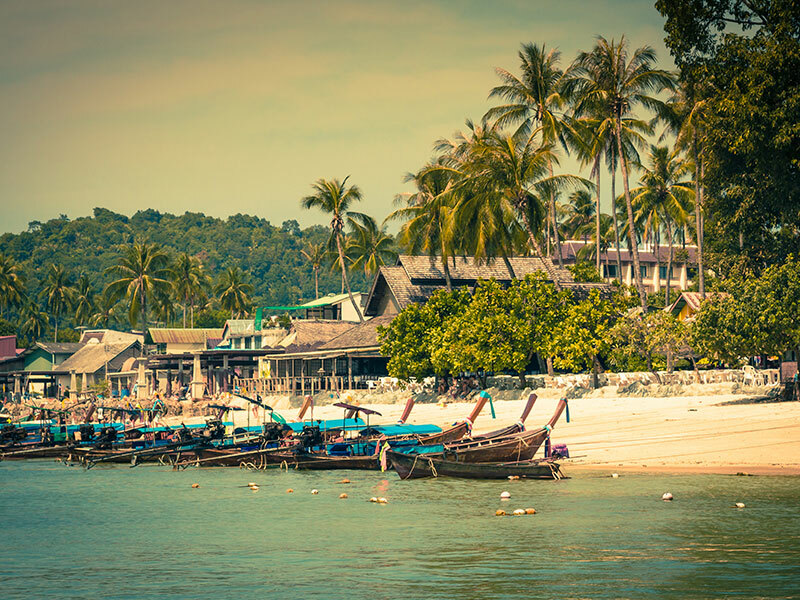 Long-tail boats line the beach at Krabi, Thailand. You may be wondering if you should still go or if your Trip Cancellation/Trip Interruption Insurance would cover the cost of your trip if you decide not to. Unfortunately, if your flights are still running and your accommodation hasn’t been affected, you would not be reimbursed if you decided to cancel your trip—travel insurance doesn’t cover a change of mind. However, if you’re not comfortable with travelling to Thailand at this time, contact your hotel or tour provider and ask them about changing the dates or giving you a refund. They may be able to help you out. If the attack is a one-off event, things will likely get back to normal soon. If you have to cancel or change your plans as a result of the bombing, contact your airline, tour company, or other travel service providers. They should be able to help you make other arrangements. You can start a claim online or over the phone. Learn how to make a claim here. Have questions about your TuGo Travel Insurance plan in relation to this event? We’re here to help. Give us a call at 1-855-929-8846 or ask us below! To keep up-to-date on travel advisories for Thailand and other countries, check out TuGo’s Canadian government travel advisories.